Bison Prosound designed the 60-200 folding portable vocal booth to reduce, and virtually eliminate, room reflections and ambient noise for the best vocal recording possible without coloration, using thick, 2" sound absorbing material. Columns cut into this material knock down standing waves and trap early reflections. 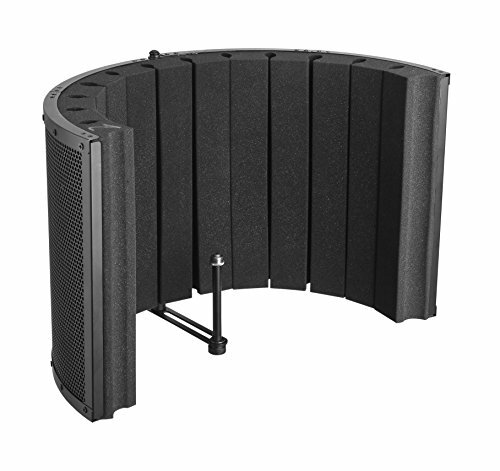 The folding shield feature not only offers convenience for storage, it also allows you to change the 60-200's effect on a recording. A wide-open position allows for more ambient sound. Folding the 60-200 to a more closed position reduces ambient sound. There are three methods for mounting the 60-200 to fit your specific needs. Attach it directly to a microphone stand for unlimited placement options about the recording space, use the 5/8"-27 TPI included stand adapter (that offers 5" of depth adjustment) to mount the 60-200 in front of your microphone, or mount the 60-200 to your microphone stand and use the stand adapter to attach your microphone. Whichever way you decide, your recording will sound better than ever! Specifications: • Overall dimensions: 19-1/4" (fully opened) to 5" (closed) wide, 12" high, 10" (closed) to 3-1/2" (fully opened) deep • Threads: 5/8"-27 TPI • Adapter dimensions: 5-7/8" long, 5-1/4" high • Adapter adjustable depth range: 1" to 5". If you have any questions about this product by Bison Prosound, contact us by completing and submitting the form below. If you are looking for a specif part number, please include it with your message.